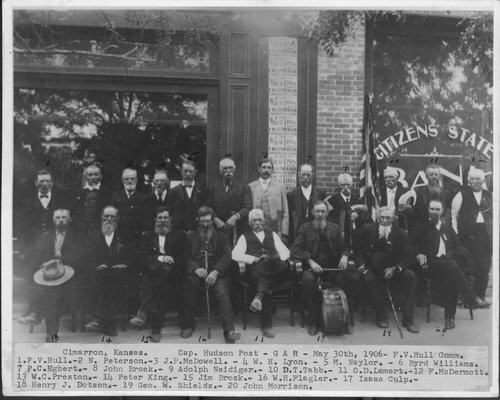 This is a photograph of members of the Captain Hudson Post, Grand Army of the Republic, in front of the Citizens State Bank, Cimarron, Kansas. The members are (back row, l to r): F. V. Hull, Post Commander, N. Peterson, J. F. McDowell, W. H. Lyon, M. Naylor, Byrd Williams, P. C. Egbert, John Brock, Adolph Neidiger, D. T. Tabb, O. D. Lemert, F. McDermott; (front row l to r): W. C. Preston, Peter King, Jim Brock, W. H. Flagler, Isaac Culp, Henry J. Dotson, George W. Shields, John Morrison. They are posed in front of the Citizens State Bank.